The history of the church is a history of real people—popes and priests, monks and martyrs, and many ordinary folks like us. All claimed to follow Christ, but not all had the same understanding of what it meant to be Christian. 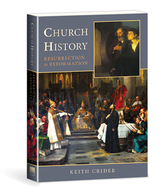 This account of the church up to the beginning of the Anabaptist movement helps us understand how the church grew and changed over the centuries. It inspires us to faithfulness to Christ and His teaching in our day.